Easy-to-grow beets do double-duty in the kitchen, producing tasty roots for baking, boiling or saut�ing and fresh greens to boil or steam. Plant them early for top quality and best flavor. (Fluctuating weather can reduce quality and create white zone rings in the roots.) Some varieties have red stems and venation in the leaves, making them a natural for edible landscaping. Prefers well-drained sandy loam to silt loam soil, high in organic matter, with pH between 6.5 and 7 and free of large stones. Good soil structure is important because growth is improved by good soil aeration. Beets grow poorly in acid soil. They tolerate low fertility but require consistent moisture. Do not plant in soils with pH less than 6.0. Beets use boron inefficiently. Boron is less available in soils with high pH and high organic matter. Corky black areas in the roots indicate boron deficiency. Some varieties have red stems and leaf venation. Germination temperature: 50 F to 85 F - Will still germinate at temperatures as low as 40 F and as high as 90 F.
Days to emergence: 5 to 8 - May take two to three weeks in colder soils. Plant in early spring, as soon as you can work the soil, � inch deep and 1 inch apart in rows 12 to 18 inches apart. For continuous harvest, make successive plantings every three weeks until midsummer. For winter storage, sow crop about 10 weeks before heavy freeze. The wrinkled “seedball” usually contains two to four viable seeds, making it necessary to thin to 3- to 4-inch spacings if you plan to harvest young, small or cylindrical-shaped roots, or 6-inch spacings for larger roots for winter storage. Begin thinning when seedlings are about 4 to 5 inches tall, and eat the thinnings. Cut rather than pull plants when thinning to avoid disturbing roots of other plants. Some “monogerm” varieties have only one seed per fruit. Some seed companies remove seeds from the seedball. Unlike most root crops, beets can be started inside or in cold frames and transplanted into the garden. Use floating row covers to discourage insects early in the season. Keep well-weeded. Competition and uneven watering can make beets stringy and tough. Beets are closely related to Swiss chard and spinach. Avoid following these crops in rotation. Beets tolerate average to low fertility. Too much nitrogen will encourage top growth at the expense of root development. Best color and flavor develop under cool conditions and bright sun. When beets mature in warm weather, they are lighter colored, have less sugar and have more pronounced color zoning in the roots. Fluctuating weather conditions produce white zone rings in roots. Beets are biennials. Normally, they produce an enlarged root during their first season. Then after overwintering they produce a flower stalk. If they experience two to three weeks of temperatures below 45 F after they have formed several true leaves during their first season, a flower stalk may grow prematurely. Many newer varieties are less sensitive to this problem. Leafminer - Cover plants with fine netting or cheesecloth or floating row cover to protect them from adult flies. Handpick and destroy infested (mined) leaves. Control weeds. Cercospora leaf spot - Avoid wetting foliage if possible. Water early in the day so aboveground plant parts will dry as quickly as possible. Avoid crowding plants. Thin plants to allow air circulation. Eliminate weeds around plants and garden area to improve air circulation. In autumn, rake and dispose of all fallen or diseased leaves and fruit. Scab - Avoid wetting foliage if possible. Water early in the day so aboveground plant parts dry as quickly as possible. Avoid crowding plants Thin to allow air circulation. 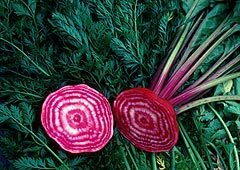 Browse beet varieties at our Vegetable Varieties for Gardeners website. Root shapes range from long and and cylindrical to short and spherical. Choose short varieties for stony soil. 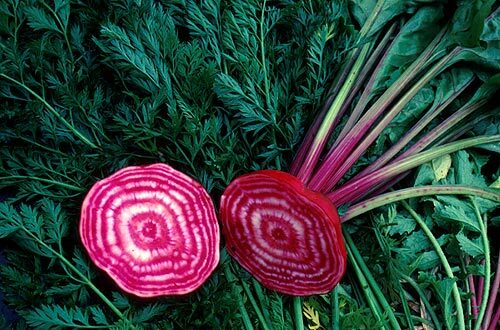 In addition to the common red beet varieties, colors range from gold and yellow to white. Some varieties are favored for their greens, others for their long-term storage.